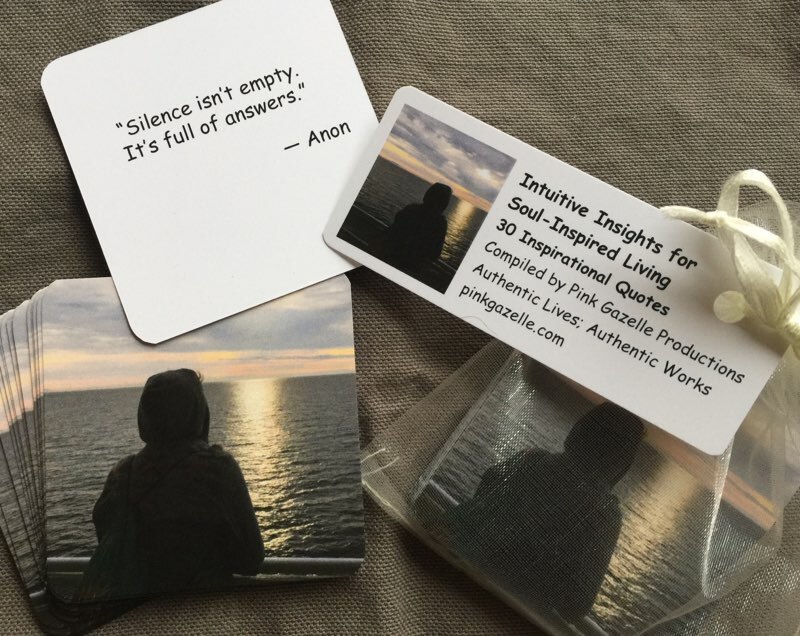 Oh yes, the little pink gazelle elves have been busy indeed…whipping up new quote card sets left, right & center! 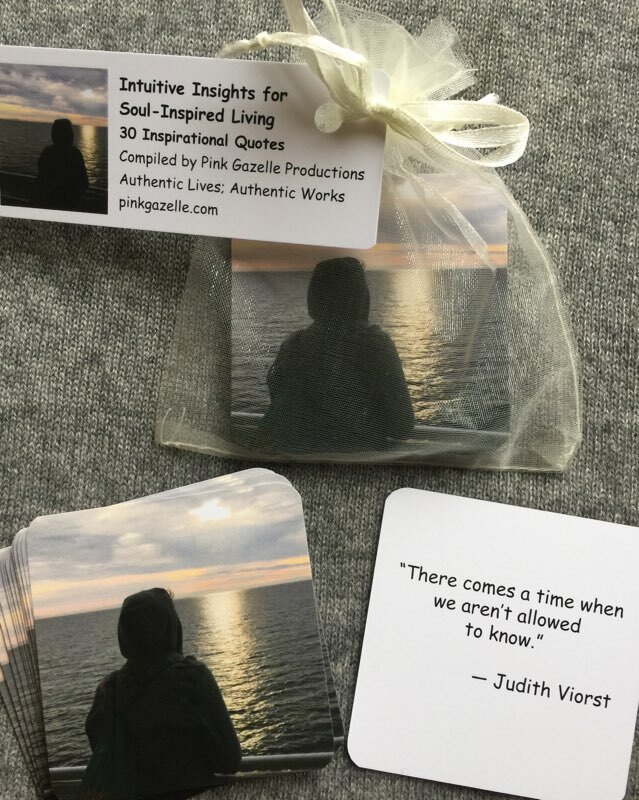 Our latest compilation of inspirational quotes is “Intuitive Insights for Soul-Inspired Living.” We love them and hope you will, too! The purpose of these particular quotes is to provide a few insights that may help us hear what our spirit might be trying to tell us. In today’s busy, fast-paced and often noisy world, there is certainly no shortage of distractions pulling us every which way. But if we can make time to sit quietly for a few moments every day, just to check in with our selves to see how we are really doing – regarding the aspects of our lives that are truly important to us, not just the ones that squeak the loudest – then in my experience, quite often we will also receive guidance on the next step that needs to be taken. As with all the other quote sets, there are 30 cards in a set. Each card is 2.5 inches x 2.5 inches. The sets are $7.95 each (plus $2 shipping) or 2 sets for $14.95 (plus $2 shipping). To read all of the quotes, please click here. To order the quote sets, please visit our on-line store. 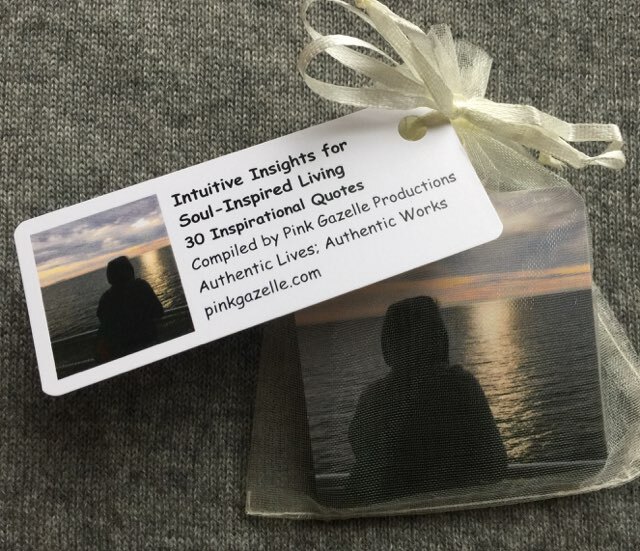 If you live in the Calgary area, the Intuitive Insights cards will be available at the Pink Gazelle Cards & Creations table at the Calgary Christmas Market – from Nov 29th to Dec 2nd, 2018. Please click here for details. All quote sets available for purchase through the PGP on-line store. If you are interested in carrying the cards in your retail store, please click here for the wholesale price list. We create literary, theatrical and cinematic works that challenge, enrich and inspire the lives of both artist and audience. Our mission is to share words & stories that empower people to effect positive change in themselves and the world around them.